No water needed. Take a bath and do your hair all from the comfort of your bed! Perfect for managing your personal care after your hysterectomy or any surgery that keeps you away from your shower or bath. We have grouped the 3 awesome No Rinse products together to save you money. 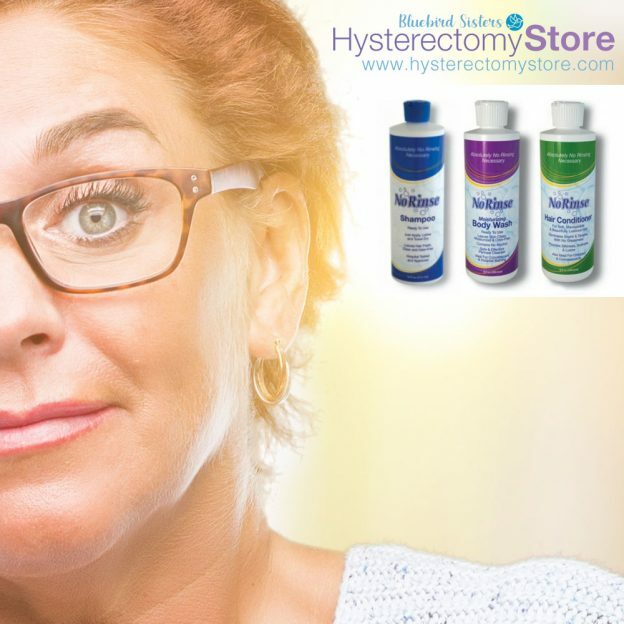 First, this ready-to-use product is used by NASA, hysterectomy and surgery patients alike! 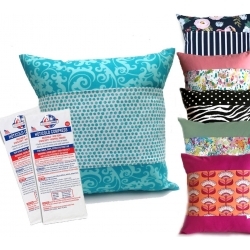 No Rinse products are ready-to-use and can be warmed in the microwave. Then you can enjoy the soothing comfort of a warm shampoo. No rinsing. And then, follow with our No Rinse Conditioner if desired. Finally, towel dry or use a blow dryer. Leaves hair soft, manageable, and smelling clean. This 8 ounce bottle is used full strength. Water, triethanolamine lauryl sulfate, propylene glycol, cocamidopropyl betaine, fragrance, diazolidinyl urea, methylparaben, propylparaben, citric acid. Use the No Rinse Conditioner after our No Rinse Shampoo for a complete clean hair experience. You don’t even have to get out of bed! This conditioner instantly eliminates snarls and tangles without greasiness. Leaves hair easy to manage and beautifully lustrous. Great to use after any shampoo as a “leave-in conditioner” and de-tangler. This 8 ounce squeeze bottle is used full strength. Water, isostearimidopropyl morpholine lactate, propylene glycol, diazolidinyl urea, fragrance, methylparaben, propylparaben. This Body Bath is great for cleansing the entire body. Excellent for the delicate perianal area, eliminating odors without the need for rinsing. Gentle, safe, non-irritating. Used by NASA and Hysterectomy patients. Water, triethanolamine laurylsulfate, cocamidopropyl betaine, propylene glycol, fragrance, diazolidinyl urea, methylparaben, propylparaben, citric acid. This entry was posted in Featured Products and tagged bath, body, conditioner, no rinse, set, shampoo, wash on April 5, 2019 by Bluebird Sisters.